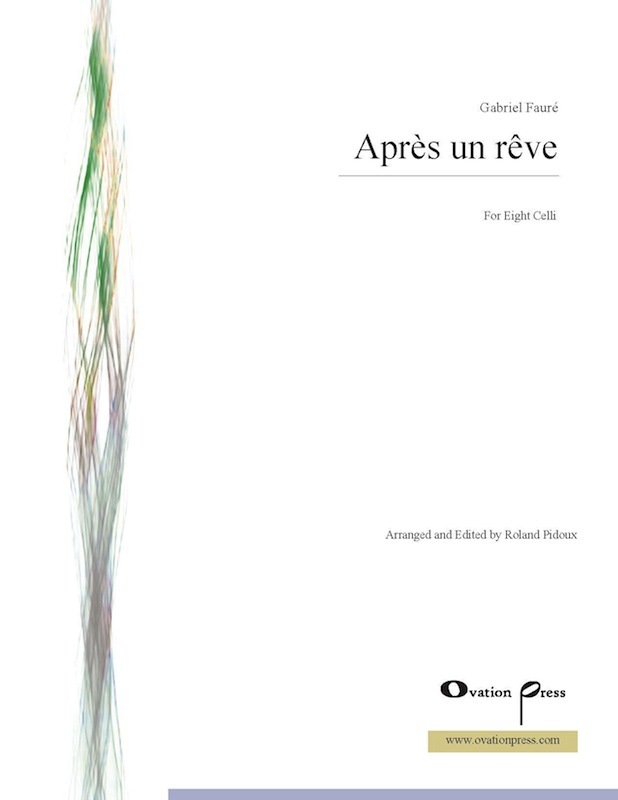 String Visions is excited to bring you an interview with Ovation Press Editor Roland Pidoux. Mr. Pidoux is currently a professor at the Paris Conservatory and the artistic director of Rencontres de Violoncelles de Bélaye, a post he has held since 1988. 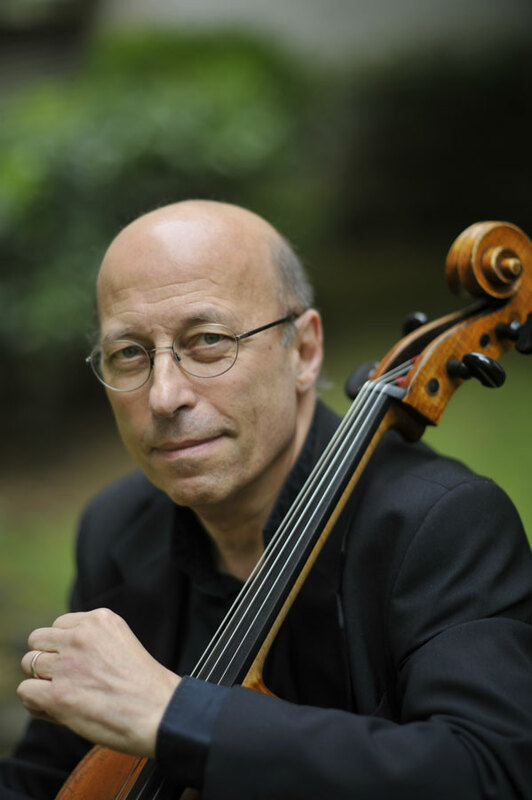 He was previously the principal cellist of the Orchestre National de France. 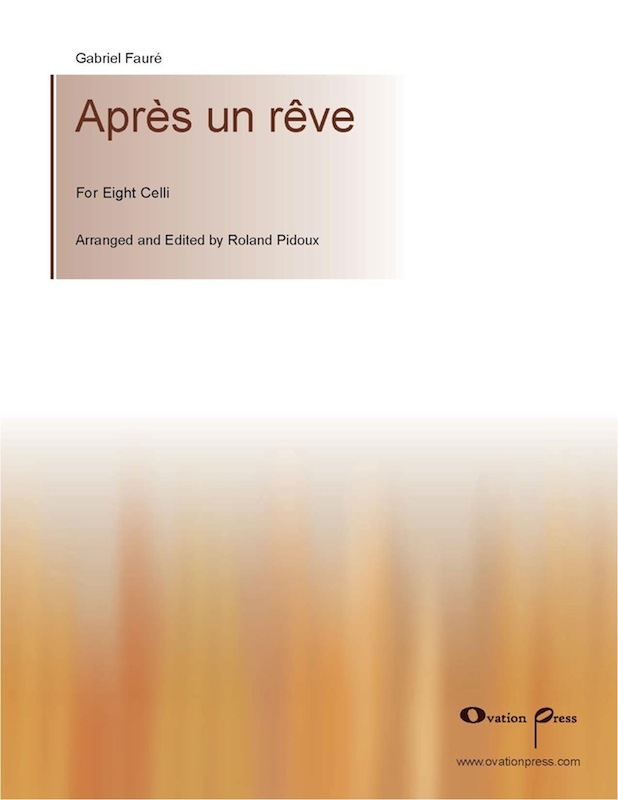 Mr. Pidoux is also the prolific arranger of the music for cello ensemble performed by Les Violoncelles Français. The interview was originally done in French and translated to English. We greatly appreciate all of Mira Luxion’s efforts in conducting this interview, and we hope that you enjoy it! String Visions: It’s an honor for me to have the opportunity to speak with you as a great pedagogue and cellist. Cello playing in France has a remarkable history. Beginning two hundred years ago with the Duport brothers, it boasts many legendary cellists including Fournier, Tortelier, Gendron, and Navarra, with whom you studied. Do you believe there is still a “French school of playing” that is alive today? 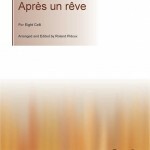 Roland Pidoux: Listen, at one period – in the era of people I knew well, who were the teachers of the previous generation including Navarra, Tortelier, etc – there was indeed a color of sound that was very French. But as time passed, that sound fed a bit off the other schools around us. One can hardly speak now of an exclusively French school. Let’s just say it’s a little more international now. String Visions: Could you speak about your experiences studying with Navarra? Roland Pidoux: Yes. I did indeed study with Navarra. I met him when I was fourteen and worked with him until the age of nineteen, and it is he who taught me everything in terms of technique. What characterized Navarra’s teaching was especially the right hand. That is to say, his entire career as a professor was focused on the right hand, on the development of the right hand, because he himself had been in contact with violinists whose bow technique was ahead of that of cello technique at the time, at least in France. And so he really tried to reproduce this flexibility of the right hand and based his school of teaching on it. String Visions: Is this something you focus on in your own teaching? Roland Pidoux: Absolutely. Well, let’s say Navarra always had a bit of an excessive approach about the hand, and the arm became forgotten a little. So, to be perfectly honest, I was also very impressed and inspired by Rostropovich’s right arm. And so I organized my own playing – and the technique I teach – around these two approaches. The advantage lies partly in the beauty and richness of the sound, and also in the extreme finesse and suppleness of the hand required for Baroque or Classical repertoires (Haydn, Schubert, etc.) which demand a great lightness of bow. In these cases, the ability to succeed musically rests in the hand. So overall, it’s kind of a synthesis of these two schools: the Russian school – let’s say – since it was represented by Rostropovich, even though he taught very, very little; and Navarra, with whom I actually studied for five years. I played with Rostropovich, but I never really studied with him. String Visions: What are some of your teaching strategies for developing the fluidity of the right hand? I must say that what interests me the most in a young cellist, a young musician, is what he has inside, his personality and artistic sensibility. Technique is only a method to convey what one feels deeply. It isn’t a goal in itself, it’s simply having all the tools to create what one wants to create. String Visions: Who, besides Navarra, have been your influences? Roland Pidoux: It’s curious, because I’ve had two teachers in my life: my first teacher, who started me off and introduced me to Navarra, and I had Navarra until the age of 19. And after that, I made myself, so to say. That is to say that I didn’t work with other cellists, but I was in contact with other cellists. This is what I wish to continue to do, and which I try to do through my cello gatherings in the Lotte, in France, where I invite cellists and we— well of course they study with me, but we play, we perform concerts together so as to be in touch with the stage and with each other. And me, it happens that I had the opportunity— well at one point in my life, I played in a string quartet and I met Rostropovich, with whom we played the [Schubert] cello quintet. I found myself sitting next to him for a series of concerts and it was extremely enriching for me. I studied absolutely everything up close because I was impressed by the amount of sound he produced. Musically, it’s a different matter of course. What interested me was this great artist’s sound. And then I met Pierre Fournier with whom I also played the Schubert quintet. With Pierre Fournier I had a different approach. What interested me about him was his class: his playing was very classy. It was extremely neat and precise, and very, very interesting to listen to. And then I must say I learned a great deal musically, and even instrumentally, from Isaac Stern. We were on a cruise together. At the time it was called the “Renaissance” and there were many wealthy Americans onboard. I played a Beethoven string trio with Isaac Stern, and then I met him when I was principal cellist of the National Orchestra of Radio France. He came to be in residence with the orchestra for a year, and we played a lot of chamber music concerts together: Schubert quintet, Brahms sextet, etc. I learned a lot from him musically— I don’t think he knew it, because I never told him. Even though we knew each other well, actually very well, I was always very intimidated and didn’t want to embarrass him too much by telling him how much I appreciated him. But I learned everything about phrasing and musicality from him, because I loved what he did. And then, curious as it may seem, I learned a lot from the phrasing of Jean-Pierre Rampal, who is our internationally renowned flutist with whom I also played a lot. And it’s the natural phrasing he had— one got the impression that he didn’t think about the music. He played it naturally, in a very beautiful way and with astounding ease. And so, here you have it. These are the most striking examples that allowed me to find the path I wanted to take with my instrument. String Visions: I would like to return to your teaching. Here in America, students spend a lot of time studying orchestral excerpts. I understand this is mostly not the case in France. As a great orchestral musician, could you speak about this difference? Roland Pidoux: Yes, you are quite right. But the mindset of French orchestral musicians has evolved a lot in the past few years. And I must say that the seriousness and the rigor of current orchestral players in France – I mean in the great orchestras in Paris since I know them better than regional orchestras – has greatly changed. I don’t mean that in my time we weren’t serious, but it was completely different. I remember very well when I entered the [Paris] Opera at the age of twenty-two, I went every night to play repertoire that changed everyday without any rehearsal. That is to say, for practically a year and a half or two years I sight-read the repertoire, except Carmen and Faust, since we played one of the two every weekend. But La Boheme, La Traviata, Tosca, really all the greats, I sight-read in concert. There was no rehearsal. And there were some horrific things, since we rotated. We had rotations, because there were more musicians than seats in the orchestra. So normally every night two musicians were off. And sometimes horrific things happened, such as one would play rehearsals and not the show, or vice versa. Of course when Ralph Lieberman came to direct the Paris Opera, he turned things around and made sure that musicians who rehearsed also played the concerts, which seemed absolutely logical. But that was the spirit because at the time musicians who wanted to play in orchestra were expected to play well, of course, but also to sight-read very well. And it’s true that the French had a reputation for being excellent sight-readers. In fact, certain conductors said, “when I conduct a French orchestra, the first rehearsal is excellent, and then it goes downhill.” The concentration was such that sight-reading went very well and after that, well, the musicians were much less serious, let’s say, and less concentrated on their work. But it has really vastly changed. I myself have helped young players a lot with orchestral excerpts to prepare for orchestral auditions. There is an impressive list of excerpts and they study them like one would study exercises or etudes, very conscientiously. Once they master an excerpt technically, putting it in context and interpreting it is much more difficult of course. But what I mean is that it’s true that musicians now are much more serious: they study their part at home. In my time, we didn’t study the part at home, we studied it during the rehearsal. I think this is the difference. It’s true that in the US… well, when my son studied in Bloomington with Starker… I attended orchestra concerts and there was a seriousness, I would almost say a pleasure, the musicians had about their orchestra. Here, even now, students at the conservatory are kind of grouchy about the orchestra. String Visions: Can you speak a bit about Les Violoncelles Francais and the pieces you have arranged? Roland Pidoux: Yes of course. Well, in 1991 I had serious health issues and one day I woke up in the hospital having had a dream. I had dreamed of all the characters— because I also played for the Paris Opera at a period when Carmen was played every week or alternately with Faust—that all the characters in Carmen were cellos. When I woke up, I found this curious. Usually I am not at all the type to analyze my dreams, but I had found this curious and thought: “why not try to do an arrangement of Carmen?” So I made this arrangement for eight cellos, and we still play it of course because it is very entertaining for the audience and fun to play. Les Violoncelles Français itself was at first mostly my son’s idea. My son Raphaël is the cellist in a piano trio, Trio Wanderer, which is making a good career in Europe and in the US. He is about 45 now, and he wished to form a cello ensemble with young people of his generation. And of course he included me because he thought, “along with my father, I’ll get all the arrangements!” So I’m the oldest one, but all eight are cellists who have a career outside the octet, because you must understand that hiring and paying for the travels of a cello octet is pretty expensive. So we don’t play a hundred concerts a year, of course. In France there is a festival called “La Folle Journée,” which takes place in Nantes, 400 km west of Paris. This festival is very important, it’s an important gathering around Christmas-time where there is a multitude of concerts over very few days, which is why it is called “La Folle Journée” [the crazy day]. Les Violoncelles Français is often invited, including this year. String Visions: Does Les Violoncelles Français have a pedagogical aim, as well as a performance component? Roland Pidoux: Yes, absolutely. You know, in the study of an instrument, one is pretty isolated. And I believe— well the students at the conservatory, I notice, don’t realize that as soon as they leave the conservatory they will find themselves terribly alone with all the problems they have. They will no longer have a teacher to help them find solutions. So already getting together and working, having a project to work on together with eight people, helps to ease… well let’s just say we can speak with each other and ask each other “hey, how do you do this?” We try to help each other, and then we perform a work together, and I find this to be very important. Indeed for me it has a pedagogical aim. I realize that at the conservatory there isn’t time to do all you would want to because you have one hour or an hour and fifteen minutes per student each week, and there are many things to do: repertoire, etc. But, more and more octets are forming everywhere… notably, one in France that is now pretty successful is the Philartcellistes from the Orchestre Philharmonique de Radio France. They want to get outside the orchestral world for a bit, and they come together to play cello octets. It doesn’t have a pedagogical goal, but the goal of playing chamber music together. String Visions: Your arrangements for cello ensemble are very unique. What are your primary concerns when you arrange? Roland Pidoux: My main concern is to be accurate to the original manuscript: absolute respect of the harmonies, sometimes of certain doublings, but mostly of the composer’s harmonies. That is, I never transform the original score to make it easier to play. I am simply led to change the octave at times because of course we have an enormous range. There are times when playing a piccolo part is problematic unless you use harmonics, but that isn’t always doable. But I stay as close as possible to the score. For example, with the Italian Suite, I always work with the original work, because the Italian Suite itself is an arrangement that Stravinsky made together with Piatigorsky. I refer to the Pulcinella Suite, which is the work Stravinsky originally composed. And, I always start from the original and adapt it to get not a symphonic or pianistic piece, but one interpreted by eight instruments of the same family. It’s identical in the sense that in the end one immediately recognizes the work. Beyond that, as far as the organization within the score, I play a lot with interactions between the instruments and with what is called— at least in France— spatialization of sound. That is, high notes don’t always come from the left or low notes from the right, as in an acoustic spectrum. Oftentimes you’ll have all the high sounds on the left and all the low on the right, but here they move throughout the eight instruments which each have a precise spot since we sit in a semicircle. Since in technical terms we are all very equal, I don’t always give the hardest parts to the first player, but also to the second and even to the eighth. String Visions: Do the members of the ensemble contribute to the arrangements? Roland Pidoux: No, no, no. Absolutely not. They are delighted when I put parts on their stands, and they have absolute trust in me. Sometimes one of the members makes a suggestion such as “I’d like to play pizzicato here,” but they’re miniscule changes that I make very willingly when they are appropriate. I am quite scrupulous and I work meticulously enough so as to be very demanding. To make me change something, it must really be an improvement, otherwise I say, “no, play what I wrote.” They are very respectful of the work I do and they are very happy. Every time, they shower me with praises. And it comforts me, but I say this because we really enjoy trying out the arrangements together. String Visions: I must tell you I had the opportunity to play a couple of your arrangements last summer at the Lucerne Festival. Eric Maria [Couturier] had brought Don Quixote and Mahler’s Urlicht for us to play. We had a lot of fun because every player’s part was interesting and important. It was a great way to learn to play together and listen to each other. Roland Pidoux: Ah yes, that’s funny, I remember he had asked me for the parts at the beginning of the summer. There are some delicate things in Don Quixote. Not sight-reading material for sure. String Visions: Indeed. 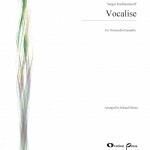 After this foretaste, I am really looking forward to seeing all the published arrangements. Could you share a few words about each work published by Ovation Press? Roland Pidoux: Yes. These arrangements were requested by the director of Mirare Records. He deliberately chose all these generally introspective pieces. That is why he called it “Meditations,” in fact, because there is nothing very lively. He wanted that kind of color for the album. Well, it was his choice. Then we agreed on works I would arrange for the ensemble. 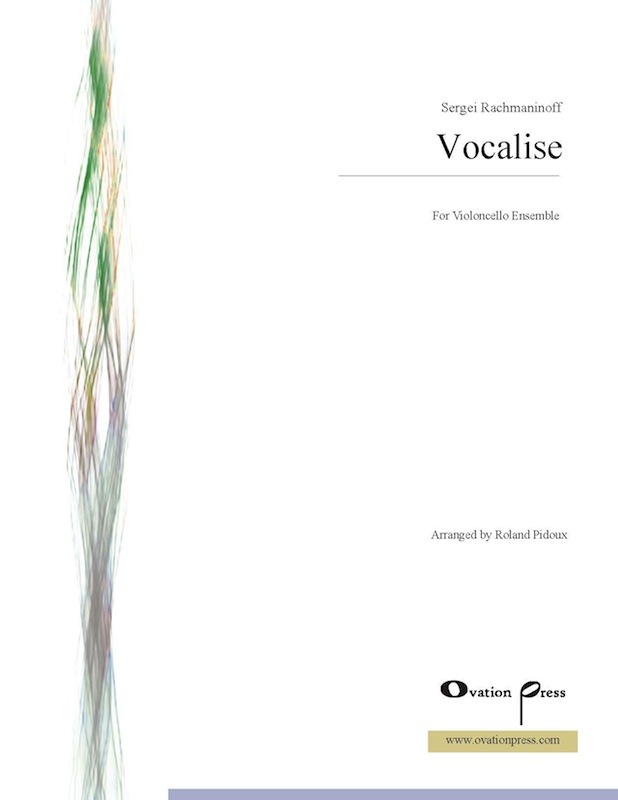 I was very enthusiastic about, for instance, the Rachmaninoff Vocalise, which is the first score published by Ovation Press, because it’s a piece that is already very beautiful when you play it with piano. I find that with eight cellos— well what I’m about to say is a bit pretentious, so I say it very objectively— I find that sometimes playing together with several cellos is somehow transcendent. It’s incredible because you find yourself in a unified sound world. 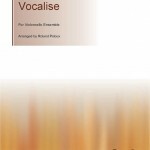 This is what really appealed to me for the Vocalise. Who plays what part in the ensemble is very free and it so happened that Emmanuel Bertrand was absolutely set on playing the first cello part for this. In this arrangement, the first cello has everything. There is no sharing between the instruments; the first cello plays the melody written by Rachmaninoff. When I arrange, I generally think about who will play the solo part. So I organize things, and it’s very important to me to know who is going to do what. 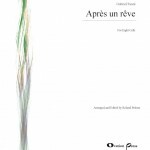 Next is Après un rêve by Fauré. It is said that the cello sounds the most like the human voice, so to prove it I arranged this song with a soloist as well. In this case it is Eric Maria [Couturier] who plays the solo cello part and the ensemble accompanies. In general, as I said before, I put difficult or interesting parts in each of the voices. But in these two works, the cellists just accompany the soloist. There is also Ernest Bloch’s Prayer. Similarly, it’s a work that makes the cello sing magnificently and which is very moving. It’s even more touching with eight players. Les larmes de Jacqueline by Offenbach is a piece for cello and piano that I discovered a long time ago. 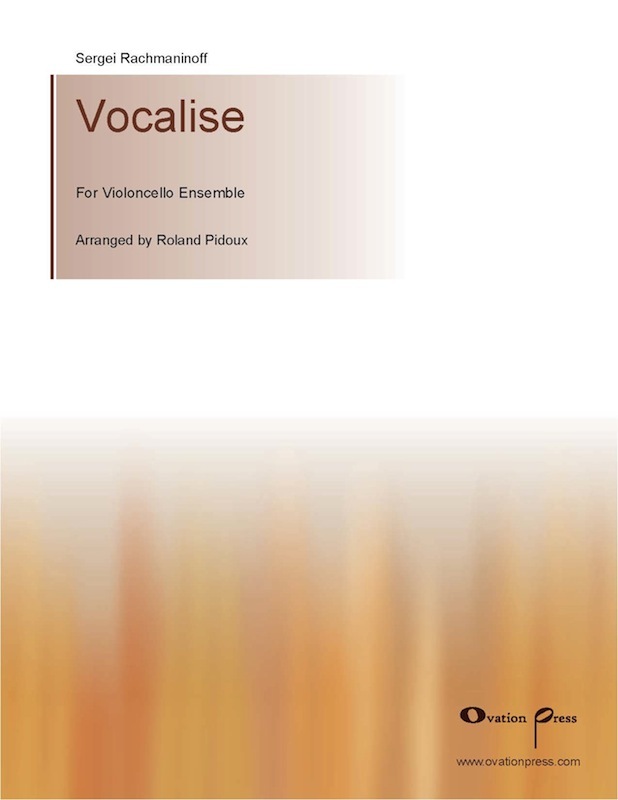 There is a version for cello and string orchestra, so this is a version for solo cello accompanied by seven cellos. String Visions: Well, I can’t wait to see and hear all of your arrangements. Thank you so much for your time and for sharing your wisdom and your music. We hope you’ve enjoyed this exciting interview with one of our dynamic editors. For more, check out Roland Pidoux on Ovation Press.